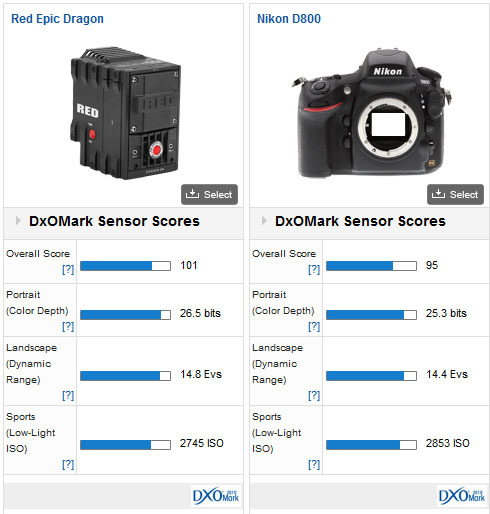 With a 5-point lead over the Nikon D800E which was the previous best-performing sensor in our database, the Epic Dragon achieves the highest DxOMark score we’ve seen to date, at 101 points. Given that the Dragon is the new reference for sensor quality, it’s all the more impressive when you consider both its size (similar to an APS-H size sensor) and the fact that it shoots ultra-high frame rates at full resolution. With the highest ever score for dynamic range and color, the new Epic Dragon sits atop our database as the best performing sensor. With the constant demand for an even wider dynamic range and color depth in both stills and cinema cameras, this is an exceptional result. As a non-commercial version, this camera will not be available in our public ranking. 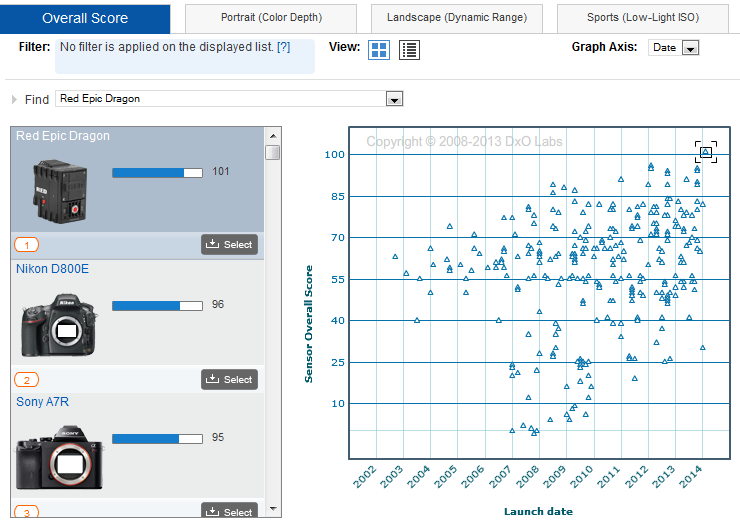 All graphs and sreenshots in this review are therefore simulations of DxOMark ranking pages. It’s hard to believe that this sensor could encroach on Sony full-frame CMOS sensors for dynamic range and medium format CCD imagers for color sensitivity. It does more than encroach, the Epic Dragon takes the top spot in both these important categories. Modular cameras, such as the Epic Dragon, are more convenient than HDSLRs in their ability to be configured for cinema work. Add to this the fact that this camera can easily meet the expectations of stills photographers looking for the tonality and latitude to files that only a sensor with low noise and a wide-dynamic range can deliver. As the new leader in this category, the prototype Epic Dragon surpasses the Phase One P65+ and P65+ HR models in color sensitivity, and it marginally exceeds the mighty Phase One IQ180 digital back in our rankings. Low-light capabilities of the Dragon sensor are excellent, beating the full-frame Sony Cyber-shot DSC-RX1 and RX1R at ISO 2534 and 2537, respectively. 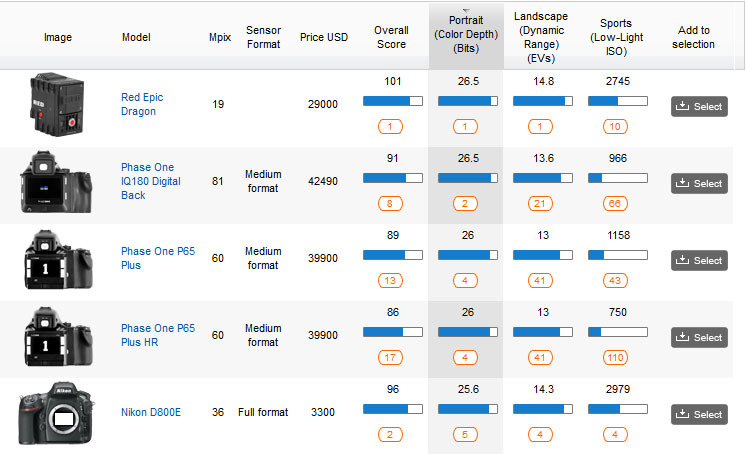 Despite the huge gains made by RED with this sensor, the Sony A7R, Canon EOS-1Dx, Nikon D600 / 610, D4 and D800 are all ahead of the Epic Dragon in this category, albeit not by much. Given the physically smaller size of the Dragon sensor and the lack of analog gain, this score is still a huge achievement. Thanks to exceptionally low noise levels at base ISO, which in turn accounts for the wide dynamic range and very high color depth, the Epic Dragon dethrones the 36-Mpix Nikon D800, Nikon D800E and Sony A7R from their previously held positions. Red has achieved what Nikon did before it with the Nikon D800. The Epic Dragon sits in the top spot thanks to the very same characteristics that helped the Sony full-frame 36-Mpix CMOS sensor achieve its position, namely an extremely wide dynamic range and very high color sensitivity. Ultimately though, this camera is an excellent alternative for those who are looking for the widest color depth in the studio (or on location with controlled lighting). The only real downside is that with the lack of analog gain, the Epic Dragon can’t maintain the same lead in performance at higher ISOs – but it’s an impressive achievement all the same. Announced four years ago and launched a year later as a ‘DSLR killer’, the RED Epic camera attracted a raft of media attention for its ability to capture raw footage, along with its highly modular design. The system’s modularity extended to lens mounts, and not just the common Arri PL mount that’s popular with filmmakers. 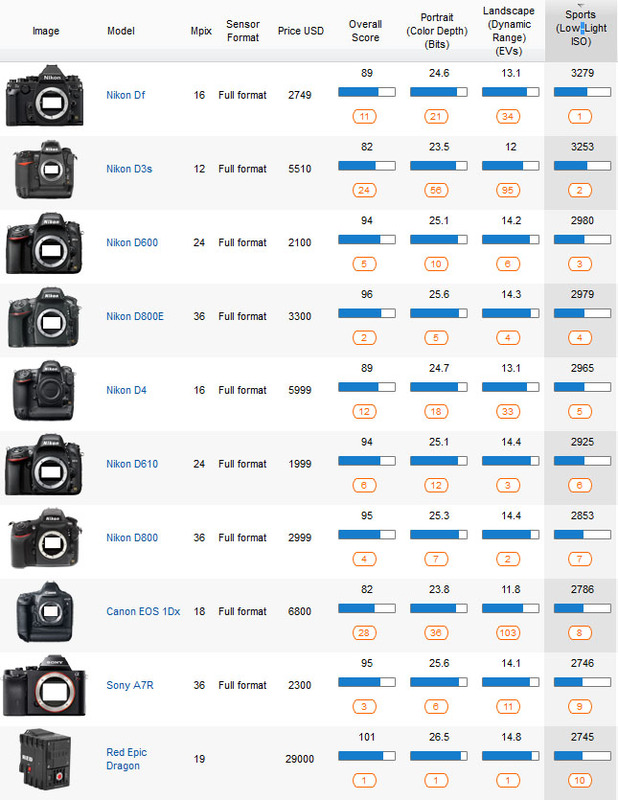 RED was taking on the new breed of Canon and Nikon HDSLRs by offering Nikon F and Canon EF mount options (the latter being fully electronic, allowing data exchange and aperture coupling). Better still, the mounts, like the rest of the accessories, require no special tools and can be swapped out using a hex-key. Apart from the choice that entails there’s the convenience of using a lens’ native mount, not to mention the potential to save both time and money on costly lens conversions. As well as the F ad EF mount options, RED also offers a Leica M mount for the Epic. Fast-forward four years and the latest Epic model appears outwardly unchanged but features a new ‘Dragon’ sensor, replacing the 13.8-Mpix ‘Mysterium-X’ sensor from 2011. That highly-rated model was capable of recording in raw from 1 to 300 fps at between 2 and 5K, and in variety of aspect ratios. But that was then. This new sensor is a 19-Mpix, 30.7 x 15.8mm Bayer pattern 16-bit CMOS sensor, and is capable of a variety of resolutions including 6K video (6144 x 3160 pixels) capture. Like the earlier Mysterium-X based model, the Epic Dragon records REDCODE RAW (.r3d), a compressed RAW format that is variable in compression ratio. It begins at 3:1 and goes as high as 18:1 for lower data consumption and ultra-high frame rates. Frame rates vary from 1 to 300 fps, depending on resolution. However, the vaunted 6K video option is only available between 1 and 85 fps. Naturally, all this capability comes with a big ticket. The Epic Dragon body is available direct from the firm at $29,000, while the body with side RedMag SSD and lens mount (as above) starts at $31,200. Existing Epic-M owners can upgrade to the new Dragon sensor and Asics from $9,500. For the tests, the camera was set to full 6k resolution at 23.98 fps, 16 bit and RC 5:1 compression. A shutter angle (exposure time) equivalent to 1/50th sec was used. As the camera was supplied with an EF mount, we adopted a Canon EF 24-70mm f2.8 L USM during the tests (though the procedures are not reliant on the lens used). It’s also worth noting that the Dragon’s native sensitivity is ISO 250 and measured at 104, while all other sensitivities were obtained by digital gain. 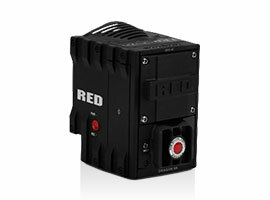 The camera records REDCODE RAW that must be processed though REDCINE-X, a free application available on the RED website. Currently, RED does not give direct access to the bayer pattern data, so we cannot include this sensor analysis and score in our official DxO Mark ranking. Given that the Dragon’s CMOS sensor technology isn’t vastly different from the physically larger full-frame models tested, it’s surprising to see the Epic Dragon’s score so high. While every effort was made to ensure the Epic Dragon adhered to our rigid testing protocols and that the results passed all the tests we performed, it’s clear the scores reflect a significantly different approach to image acquisition. As mentioned earlier, the Epic Dragon offers a wide range of different compression ratios, which allow various frame rates. We chose to analyze the camera’s output at a low 5:1 compression ratio, allowing for a high frame rate while also preserving a high level of detail. 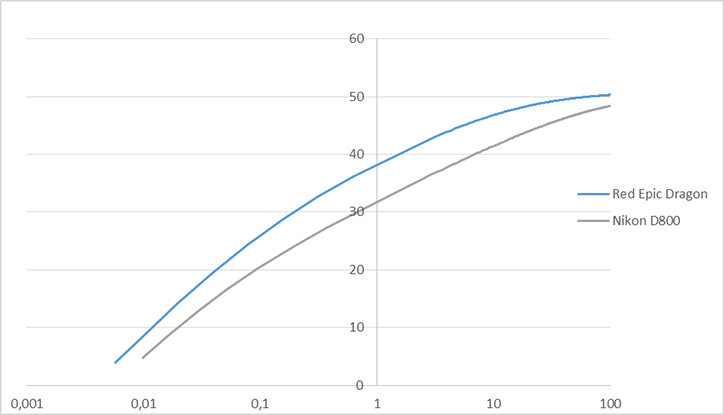 As illustrated in the following graphs, we did noticed a very slight spatial correlation in some parts of the dynamics, but nothing heavy-handed enough to impact score significantly. This is a real plus for image quality, as noise reduction filters lower spatial resolution and degrade the effectiveness of a RAW convertor’s noise reduction capabilities (such as DxO Optics Pro’s Prime Noise Reduction). 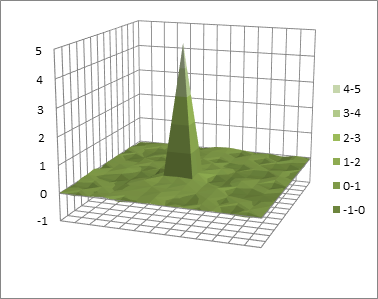 The example above shows autocorrelation for gray level at 18% of the sensor’s dynamic response on the green channel. The single peak clearly indicates that no spatial noise reduction filter is being applied in that case. The highest color sensitivity ever measured: exceptionally low noise at the base ISO. The headline news is, of course, that of the Dragon’s exceptionally low noise levels. The SNR (signal/noise ratio) curve shown above is simply outstanding – it’s higher than the Nikon D4’s curve for the whole of that sensor’s signal response. The shape of the response curve is interesting as well. 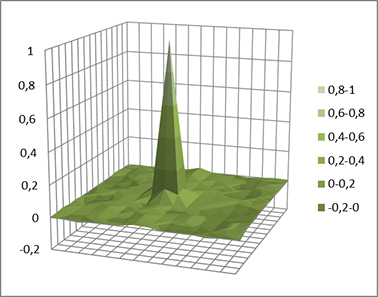 Close to saturation point, it shows a kind of plateau or leveling off, which indicates that the SNR is mostly limited by some pixel response non uniformity and not by the photonic noise. This noise curve, coupled with a good color response, leads to a very high color sensitivity. At the pixel level (screen mode), the color sensitivity is simply the best ever measured. We normally calculate color sensitivity using an 8-bit output sRGB colorspace. In this case, however, the 8-bit sRGB color space was not large enough to accurately represent the color sensitivity of the Epic Dragon. As a result, we had to switch to a 16-bit sRGB color space! Spectral response: high sensitivity of the RED channel. The color response of the sensor shows an unusually high sensitivity on the red channel (see graph below). This certainly contributes to the overall sensitivity of the sensor. Also, in daylight illumination, red and green are saturating for approximately the same exposure. 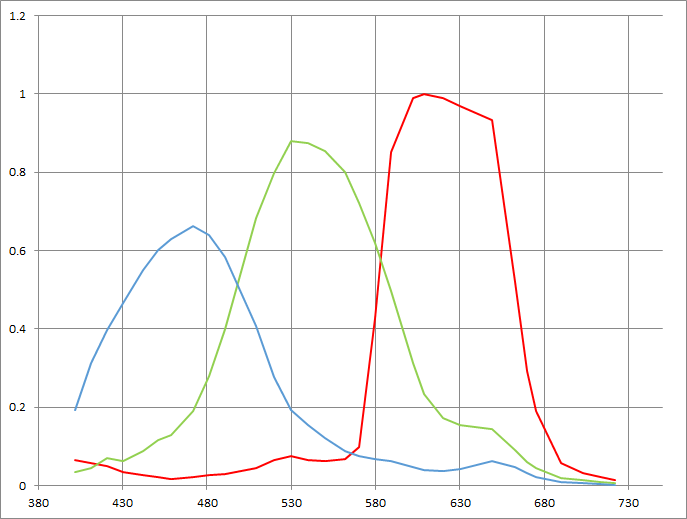 This yields a very low amplification of the red channel, with respect to the green that will be needed for white-balancing (In D50 illuminant, the red white balance scale is only 11% above the green one). Sensor size and multiple sampling. With a sensor area 0.56 x smaller by surface area than a 35mm (24 x 36 mm) full frame sensor, the results are very impressive. As the sensor and image processor can deliver very high frame rates, the Epic Dragon is certainly adopting multiple sampling techniques to reduce noise levels (also known as temporal noise reduction). Without such processing, such high SNR would only be possible from a sensor with an exceptional Full Well Capacity. Performances like this seem, to us, above the current technical capabilities of CMOS sensors. As a side note, it’s interesting to speculate whether rivals such as Nikon, Canon or Sony are already adopting such techniques during video capture or in jpeg. But, this is the first time we can assess this type of performance on still RAW. Digital Gain and dark uniformity in the field: slight weakness. Contrary to the more conventional still camera which adopts analog gain, cinema cameras like the Epic Dragon do not have to provide such features as most footage is captured in good lighting (or controlled) conditions. The Epic Dragon was designed with this purpose in mind. It’s also worth noting that the Epic Dragon only has one ‘native’ ISO setting (ISO 250 which is measured at 104), the others are achieved by applying digital gain. 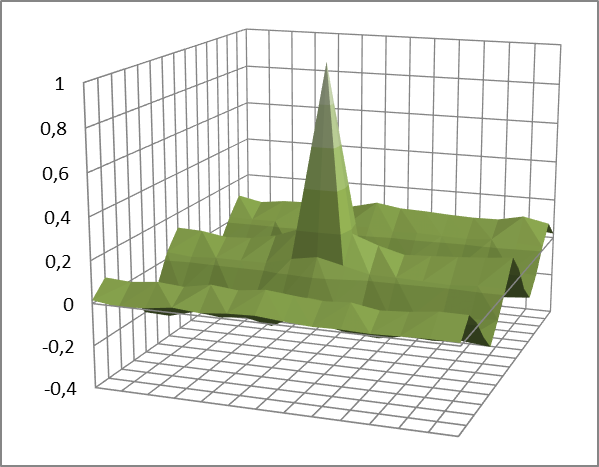 To realize the full DxOMark sensor analysis we had to apply digital gains and then stress the darker part of the dynamic. And so the problems begin…. First of all, a very small row/column noise was detected on the dynamic darker part, as you can check with the line detected on the autocorrelation shape below. This very small row/column noise does not impact the incredible dynamic range at the base ISO, but as digital gain is applied to achieve higher ISO settings, it becomes significant, affecting noise levels (and the respective amount of spatial correlations), thereby decreasing dynamic range (as you would expect). We also noted a dark non-uniformity in the field: the mean value can vary from 1 to 3 grayscale shades (for a 16-bit per sampled pixel). While this isn’t important for base ISO, we had to take it into account extrapolating the higher ISO sensitivity settings. Conventional DSLRs benefit from Analog gain that seems to amplify read noise and fix pattern noise in a smaller way than a pure digital Gain. 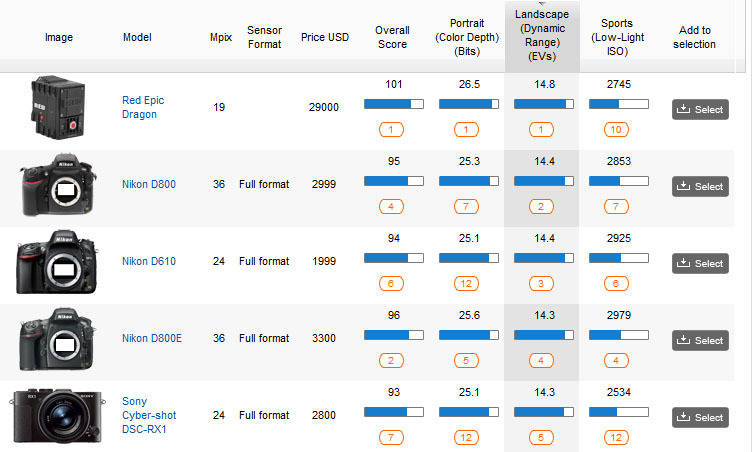 This explains, despite its quality, why the Epic Dragon has lower low-light performances than the top DSLRs. So for cameras, where the lighting can’t be controlled, analog gain is preferred. That’s not such a high priority with a cinema camera, but the Epic Dragon produces very clean looking files and can be used safely up to nearby ISO 3000, with an excellent image quality. While the results and quality of output from this specially-adapted Epic Dragon are awesome, it’s all the more extraordinary, considering the sensor size and pixel pitch. It’s hard to imagine anyone being disappointed by the Dragon’s performance (except maybe at extremely high ISO). Given the Epic Dragon’s price tag, this camera isn’t for everyone, but it will appeal to those that demand the most nuanced color and with widest possible dynamic range. More importantly, the ability to choose a high quality still photo from a movie sequence will be invaluable to time-pressured imaging professionals, in the studio or elsewhere. While this will take some time to filter down to consumer level HD-DSLRs, this new technology just may forever change the way both footage and stills are shot in the future.